It’s a common question that’s asked when strangers meet, but how would you answer that question if you were unemployed? In the absence of work, how do you identify or imagine yourself? Professor Jordanna Matlon’s research explores this idea in relation to race, gender, and capitalism in the city of Abidjan, Côte d’Ivoire, where most of the population is out of work or underemployed. “The backdrop of my own personal life experience is that I spent time in West Africa as a child,” says Matlon, who lived in Côte d’Ivoire and its neighboring state Burkina Faso during her formative years. It wasn’t until she returned to Abidjan, considered “the Paris of West Africa,” in 2006 to conduct immigration research for her dissertation that her interest shifted to the city’s employment. “When I arrived [in Abidjan], what really struck me was that so many people were out of work, even educated people. My family friends—their father was a former Minister of Labor in the country under a former regime—were educated in the US and Switzerland, and they had no jobs. Even though their family still lived well, and there was always food on the table, my friends passed most of their time at home, watching television, music videos, and MTV. There was just nothing for them. Everything was in stasis,” says Matlon. 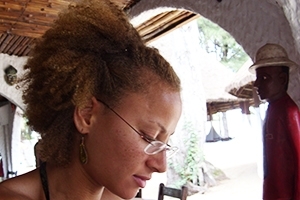 Since then, Matlon has conducted field research in Abidjan and is in the process of writing a book, “I Will be VIP!”: Racial Capitalism and Imaginaries of Blackness from Colonialism to Crisis, which explains racial capitalism by examining the history of the former French colony Côte d’Ivoire, contemporary labor narratives, and how black masculinity has been imagined by the West. Prior to Côte d’Ivoire’s independence from France in 1960, for example, only those who demonstrated that they met the French standard of “modern,” which is to be culturally white or assimilated, received employment as civil servants and entitlements from the state. However, a majority of the population did not meet those modern requirements and instead were unemployed or sought informal work to survive. During Côte d’Ivoire’s independence, those civil servants gained control of the state as a new regime. “The modern economy never fully penetrated, so formal work, the private business sector, none of that stuff really happened, and there was this huge reliance on the state,” says Matlon of the long-standing unemployment and financial crisis. Her field research and the bulk her book delve into the labor narratives that shape black identities of two groups of men: those who drew on ties to the state by acting as street propagandists for the regime, and those in informal work who sold random items such as phone cards, car mats, or toilet paper to survive. And this is where the trouble lies. While “I Will Be VIP!” is still in the work, Matlon is hopeful that her research in Abidjan, Côte d’Ivoire, could serve as a model for understanding how racial capitalism is perpetuated at the crux of survival and status for un- and underemployed black men globally. For more information on Professor Matlon's research or to see a visual tour of Abidjan, visit her website.